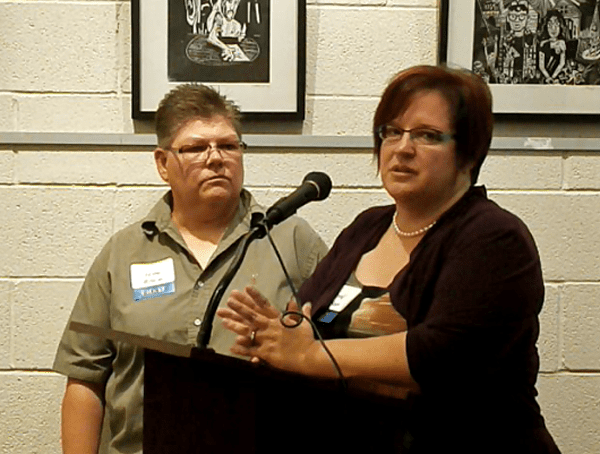 The Hazel Park lesbian couple suing Michigan and Oakland County for the right to jointly adopt their children and to marry each other is getting even more attention and support as over 100 people gathered at Affirmations Community Center in Ferndale for a fundraiser last week. The keynote speaker for the event was Wayne County Prosecutor Kym Worthy. Worthy is an advocate for adoption, and has three adopted children of her own – a 16 year-old and a set of 4 1/2 year old twins. She spoke from experience when she said that Jayne Rowse and April DeBoer had already been proven to be good parents by the state, explaining that the vetting process for adoptive parents is “rigorous.” The only difference between her adoption and the adoptions by Rowse and DeBoer, is that if Worthy decided to get married her husband could also adopt her children. In the Hazel Park couple’s case, the state forbids it. “What makes me better than Jayne or April? Why should I have more rights? Why should I have more choices? The only difference is they are a lesbian couple. How is that right?” Worthy asked. Worthy complimented the women, pointing out that one is DeBoer is a neonatal intensive care nurse and Rowse is an emergency room nurse, both working in Detroit. “Two nurses. How much better parents can you get?” she said. “Their three children have high special needs and suffice to say there’s not a line around the block of parents wanting to adopt these children. That’s why this is all so ludicrous. Now the state would rather let these children linger in foster care rather than let two gay parents adopt them legally. DeBoer thanked the crowd for coming and the attorneys working hard on their case. “We are just telling you how we feel. We are making people aware of what we’re facing because in the long run if these laws don’t change, there are going to be a lot of families like ours that are leaving Michigan,” she said. The case moves forward on Oct. 16 when District Court Judge Bernard Friedman is expected to rule on a motion for summary judgment. Last week’s event raised over $20,000 to help the couple fight their case.